← Why are we negative about what other people do? So, how did I come to make the image? I went looking for information about lists of banner books in Australia. One of the points stressed about the censorship regime of the previous government (but not that of the new one) is that while the list of banned books is available (or you can test for them), but the list of banned sites is not. It was interesting to see that ‘Fahrenheit 451’ was amongst the lists I found, because of coarse language used. Which sparked the above poster. The current government is trying to impose a blank filter on all Australians. This is despite the reports received about the effect on network speed, and the unreliability of filters. 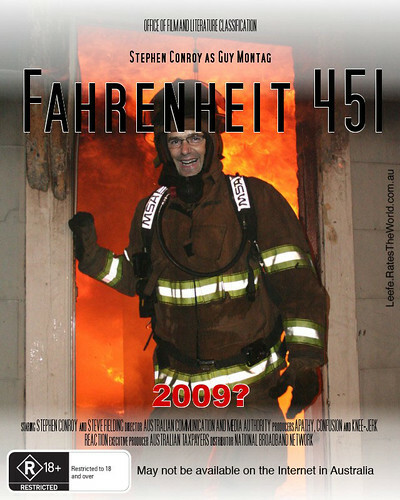 Perhaps the movie should be called Centigrade 435 after the temperature at which network cables ignite? Yippee! A banned book list! This entry was posted in Movies, Tech, Web sites and tagged Australia, censorship, Fahrenheit 451, filter, government, Internet, mandatory, Stephen Conroy. Bookmark the permalink.